The FedEx Cup playoffs took a week off. Does that cause you to lose interest or does it create a pent up demand to see the finish? Matthew MacKay, Golf Away Tours (@GolfAwayTours): I didn’t really think about it too much, to be honest. I can’t seem to get into the whole golf playoffs thing. Wake me up once they get to Riviera next winter. Jim Deeks, Fairways Magazine (@jimdeeks): If there was a clear competition among Spieth, McIlroy and Day, then I’d be suffering from mild withdrawal from the week off. Otherwise, it’s no biggie for me. In fact, it was kinda nice to watch the Evian Championship exclusively over the weekend. Craig Loughry, GAO Director of Handicapping (@craigloughry): I lose Interest. I’m like most Canadians I guess, interested in The Players, Majors, Canadian Open, Tour Championship and any other event a Canadian or Tiger is/are contending in, the rest are fillers. The week off? Meh, out of sight out of mind as they say. Peter Mumford, Fairways Magazine (@FairwaysMag): Given that I had minimal interest in the awkward playoff format before the break, I have none now. Would they stop the Indy 500 half way through to give the drivers a rest? I’ll likely watch the final but until the PGA Tour comes up with a true playoff format, there isn’t much drama. It’s never been about determining the best player – it’s just an embarrassing cash grab. How about getting it all done in one week – 125 players to start, four rounds with a cut after every round and only the Top 30 make a cheque? Dave Kaplan, Freelance Writer (@davykap): Well with the Jays playing the Yankees for the pennant and the commencement of the 2015 NFL season over the weekend, there was no chance that I was going to be watching golf anyways. I don’t think the week off makes much of a difference either way other than that it gives the field a chance to get a week’s rest in order to bring it down the stretch. Hal Quinn, Freelance Writer, Vancouver: Having never wanted the FedEx to advance past the discussion stage, let alone take on a life of its own, and then one so convoluted that it requires the mathematical genius of a Steve Sands to render it even more confusing and meaningless, there is unquestionably a pent up demand to see it finish, permanently. The raison d’être is be compete for U.S. TV viewers with college football on Saturdays and the NFL on Sundays (both impossible) as summer winds down. The only available stratagem (money) is naive and irrelevant for the would-be fans and especially the players. As we breathlessly head into this weekend’s play (under some corporate sponsor’s name at some venue) the guys who we wouldn’t mind watching hit a few shots have already pocketed $10.3 million (Spieth) and $7.6 million (Day) this season (tens of millions in endorsements not included). How about a few guys who haven’t won anything this year, except American currency? Stenson ($3.9 M), Casey ($3.1 M), Garcia ($2.6 M), Phil ($2.1). If the non-winners have already cashed that much, how is the greens fee paying, club buying, golf on TV watching public supposed to care about who wins the FedEx $10 M bonus? David Feherty has landed at NBC. How do you see him fitting in with Johnny Miller, Roger Maltbie and Gary Koch? Loughry: Feherty will complement the NBC crew – none of them have a sense of humour, at least not during telecasts. David’s quick witty humour will breathe some life into that bunch…I hope. Kaplan: I think this crew is going to be fun to watch. I can only imagine the stories that Feherty and Maltbie are going to tell … but what interests me even more is the possibility that Feherty could potentially extend his role beyond golf at NBC. He is obviously going to be a big part of the golf broadcast during NBC’s Olympic coverage in 2016, but maybe he will play an even larger role in Rio. 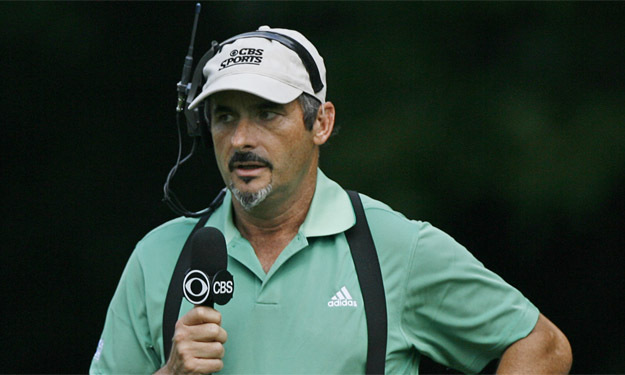 I would spend more time watching the Olympics if David Feherty was hosting the broadcast. Quinn: Yes, right on cue Feherty is moving to the Peacock, an appropriate perch for the formerly modest Ulsterman. As for his landing, no one fits in with the manic oddsmaker Miller; everyone gets along with Maltbie, even if they no longer head to the bar after the red light goes off; but Koch is unfittable, in any medium. It will be must-listen-to TV when the serial interrupter ‘steps’ (broadcast term for the cardinal radio/TV sin of talking over a co-host) on Feherty’s carefully written and well-rehearsed ad libs. It will be music to every golf fan’s ears to hear the irate Irishman make Koch finally STFU or whatever the broadcasting term is for humiliated into silence. After a few of those, he’ll fit in just fine. Deeks: I get the feeling that there’s far less ego on the NBC crew than CBS with Faldo, McCord and Nantz. So I would think that they’ll enjoy having Feherty join the team. But don’t kid yourself – I once spent an afternoon with Feherty, and he sure expects to be the centre of attention. MacKay: I think he’ll fit in well. It’ll be quite an interesting dynamic between Feherty and Miller and I’m sure he and Maltbie will have a really good rapport and share a few laughs. Koch can play the straight man. Mumford: I’m looking forward to it. I expect Feherty will have a somewhat expanded role and will fit in well with Maltbie and Miller. As for Koch, he rarely exhibits anything close to a sense of humour so I’m not sure how well he and Feherty will mesh but overall it should give the NBC telecast a boost. Golf Magazine recently published its list of Top 100 Courses in the World. How many have you played and which one would top your wish list? Quinn: I feel very fortunate to have played 18 of them, an appropriate number with three in the top nine, and happily only one now owned by the hair that would be president. The wish list to play again is topped by Valderamma (Faldo says the practice facility and range is the best in the world, and it’s definitely the best I’ve been to), with Cape Kidnappers, Royal County Down, and St. Andrews rounding out the foursome. The wish list to play for the first time has to be Augusta National, the odds of that happening about the same as the Donald being invited to join. Loughry: I’ve been lucky enough to play 13 on the list. Also proud to say I’ll be crossing two more off by the end of the year, weather permitting). Augusta National is on MY DREAM list. Anyone reading this that may potentially have access, know that I would have a lifelong crush on you if you could make it happen. Mumford: Like most golfers I’m always curious about rankings and Golf Magazine does them better than any other entity. No argument with the current list but I’m curious that St. George’s and Cabot Links make the World Top 100 while The National does not. It’s usually at least neck and neck for No. 1 in Canada. I’ve played 19 of the Golf Magazine Top 100 including seven in the Top 20. Many of the rest are on my Bucket List but the one at the top continues to be Cypress Point. Deeks: I’ve played 14 of the Golf 100, and another 272 courses besides. My favourite course of all time is Sunningdale (Old) in Ascot, near Heathrow Airport. A couple of courses on Golf’s list would not make my top 10: the Old Course at St. Andrews (as a golf course, not as an icon), and Carnoustie. Conversely, many of my favourite courses are not on the Golf 100: Gleneagles (King’s Course), Hawk Ridge in Atlanta, and Muskoka Bay. Pine valley tops my wish list, followed by Cypress Point and Royal Melbourne. Kaplan: I am sad to say that I’m an 0-for on this list. But if I could play any of them, I would definitely go with Cypress Point. MacKay: I’ve always thought Golf Magazine produces the best world top 100 list, although it does seem that exclusivity and pampering of raters has infiltrated even its esteemed group of panellists. I’ve been lucky enough to have played 34 on the list but the one I really want to see is numero uno, Pine Valley. Everyone I’ve talked to who has played it says it’s simply on another level.